February 2017; winter in the foothills of SC hasn’t been much more than a refrigerator door left open; other than that I’ve slowed from paddlin trips. Maybe its a ‘cycle’ of sorts but from the moving streams and lakes that I’ve meandered – it’s more like I’ve “stopped to feel the bottom of ‘wherest I stand.” What kind of rhythm is this ‘life-at-60‘ in? 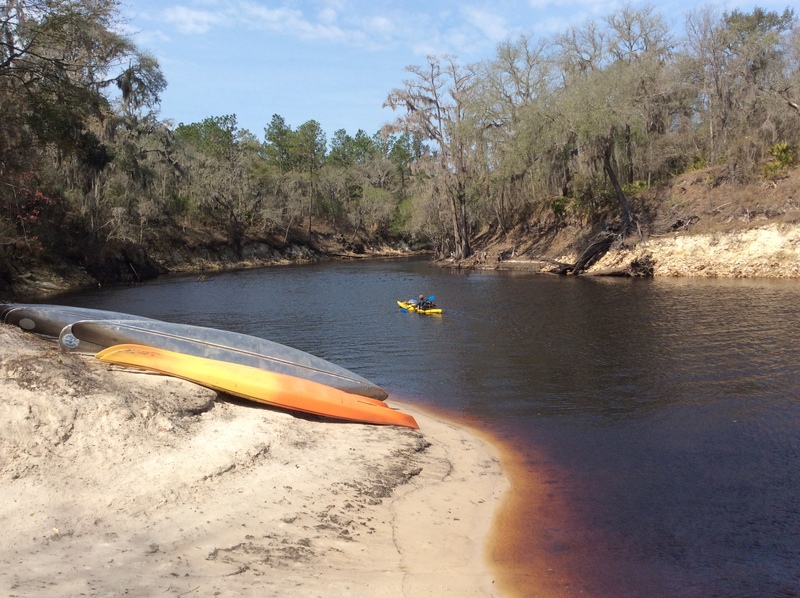 At the same time, paddlin friend Gordy was hunting a way to ‘unplug’ and had planned a Suwannee trip of his own, – I pondered whether to paddle along. 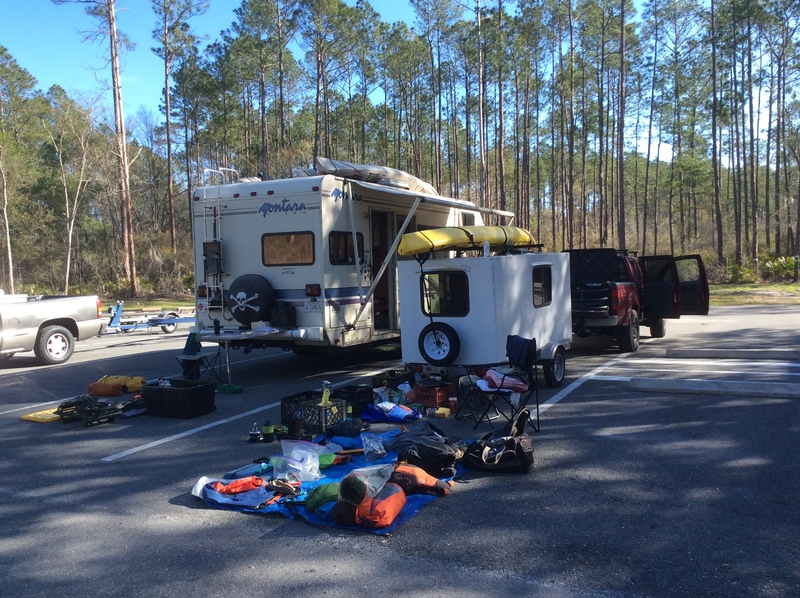 Having just returned home after already a pretty good couple of weeks at Fisheating Creek in South Florida; rv style, ‘feet-up,’ ridin old folks bikes, and visiting with old friends. I was pretty satisfied. 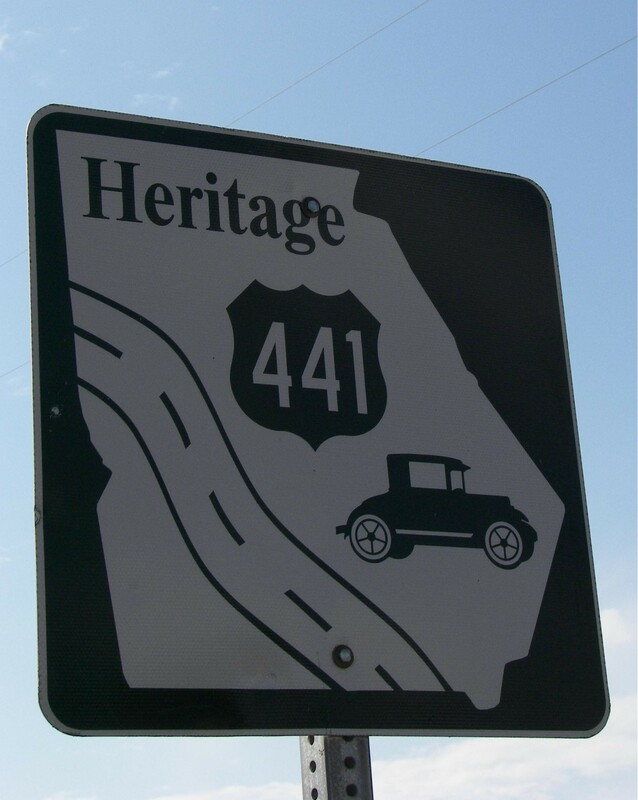 On the return trip I did make a stop at Fargo, Ga, where the Suwannee river crosses under hwy-441. With no plans of paddling I just wanted to stand in the water and take a moment to reminisce. 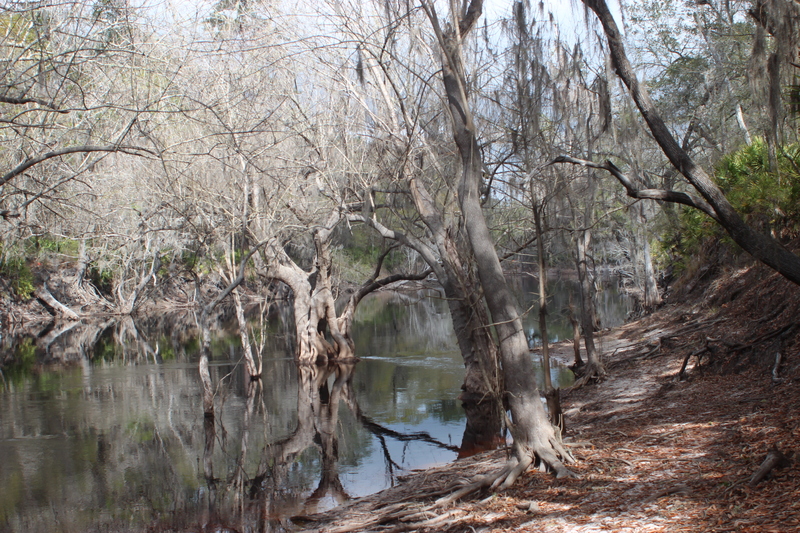 The creek was swollen with the early spring rains and it beckoned. 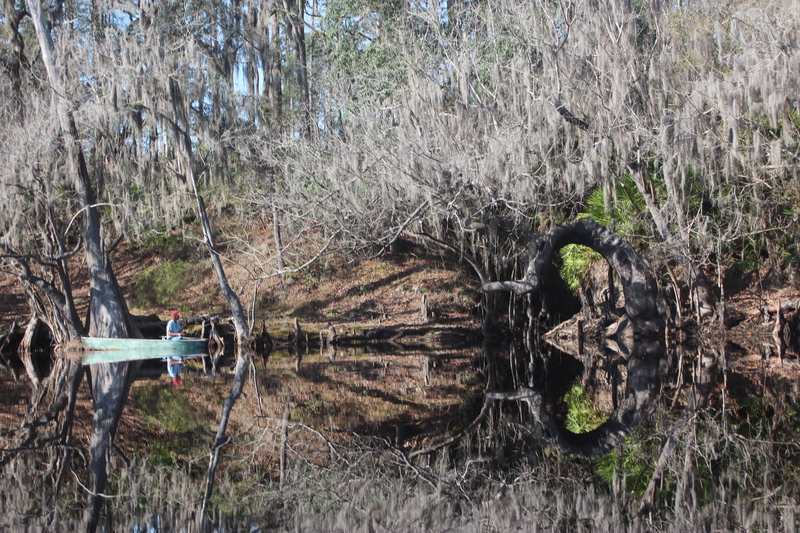 I stood in the cool tannic waters in my chaco’s; and said “hello;” it felt good. These thoughts followed me home. 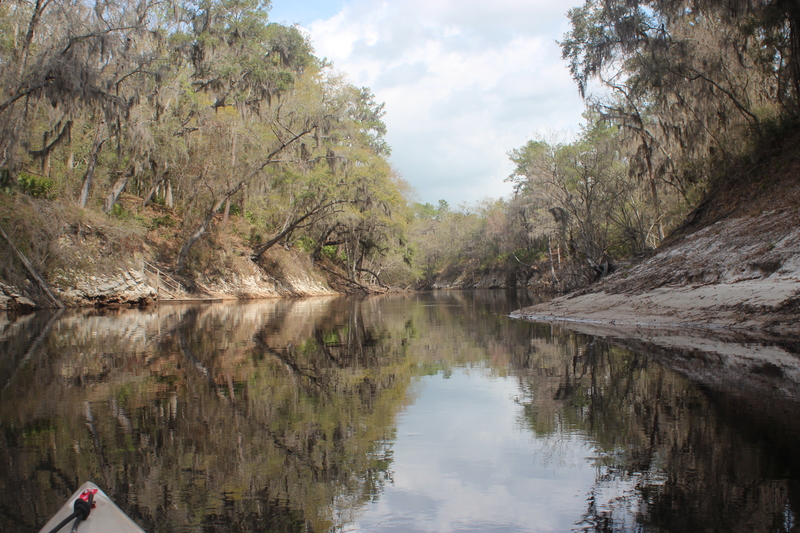 The river at the time was over the 55 foot reading for White Springs (a common gauge for paddlin the Suwannee); the water in Fargo was moving along really well. 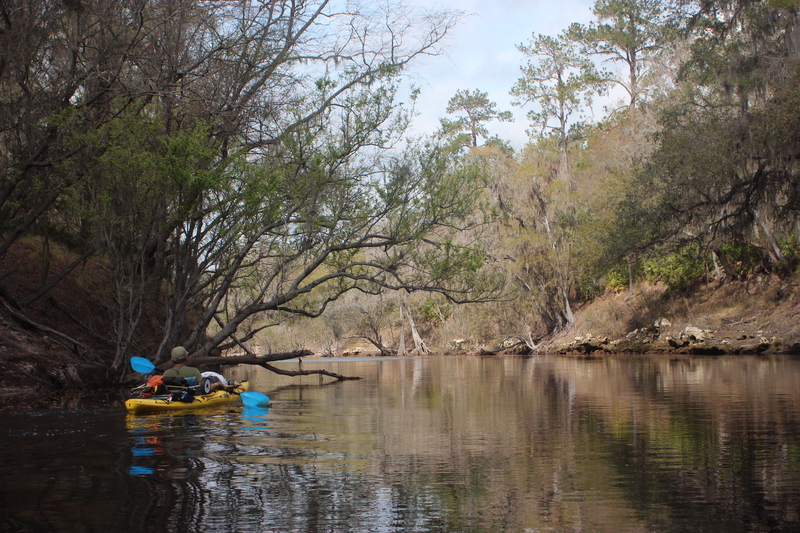 I’ve paddled the river at 51 feet and at 61 feet (lower and higher) so it wasn’t hard to imagine a few days atop the Suwanee’s current – along with the warmer southern weather – it was inviting. I pondered what else if anything I had going on. It was true My Dad’s estate still lingered and I really did need to make a trip to the Sanford area and touch some bases there. 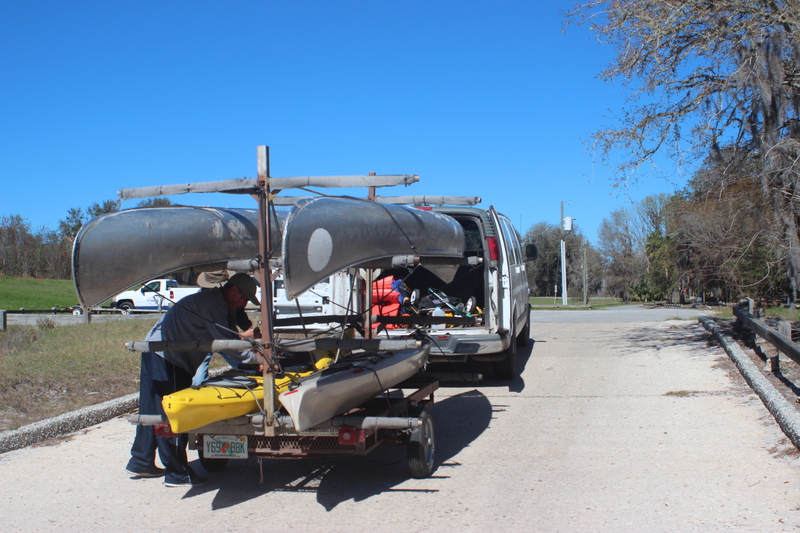 Maybe a trip for that reason could include a 4-day, @77 mile paddle. Yes! cool – thanks Dad.. 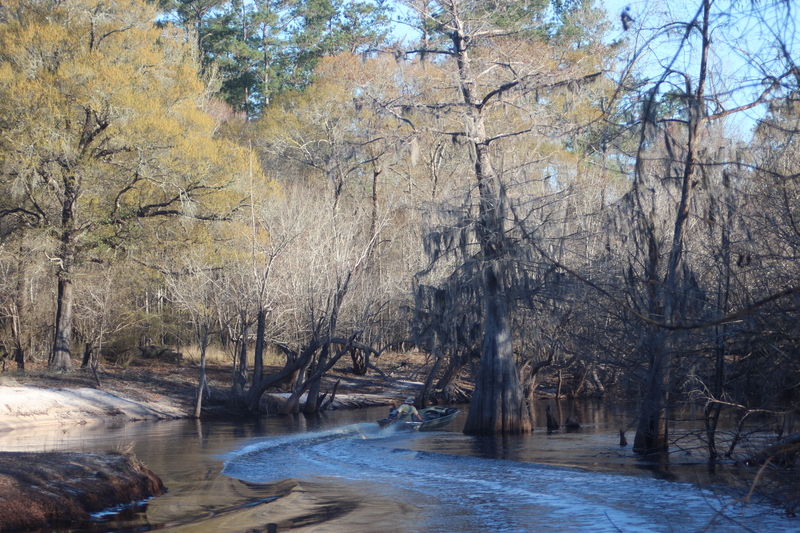 The river for our paddle would be running at/about 53-feet – using the White Springs reading. 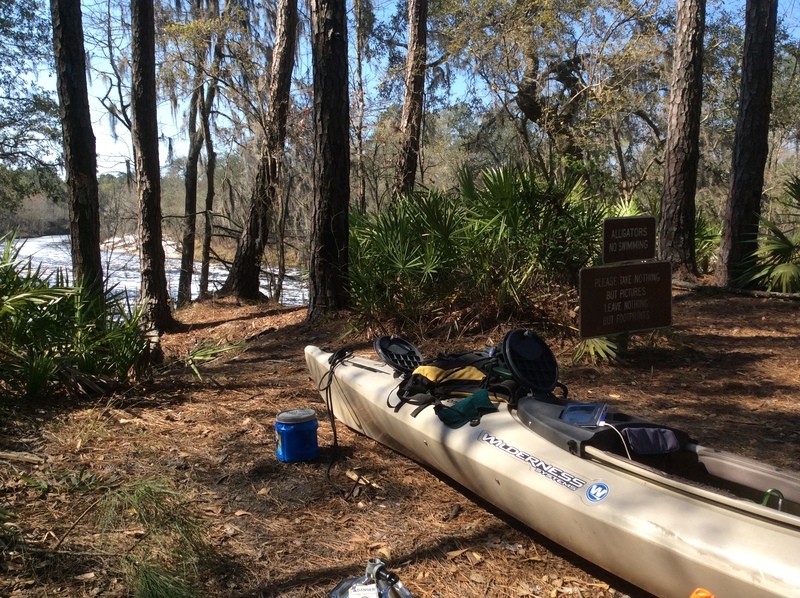 Options for the night before a Suwanee river paddle include the Suwannee river state park or a hotel at the next exit south on I-75. After a couple nights at Cone bridge we stopped by the Music Park (where Suwannee Canoe Outpost folks are located) – BINGO! they were happy to shuttle us to Fargo right then, a day earlier than planned. 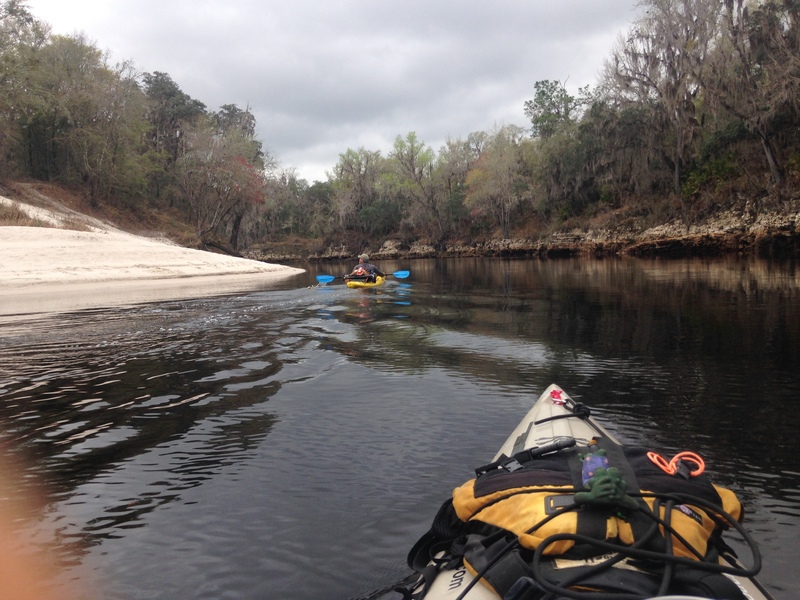 and there we were; back on the river again…….. In its own way yes, better’n home. 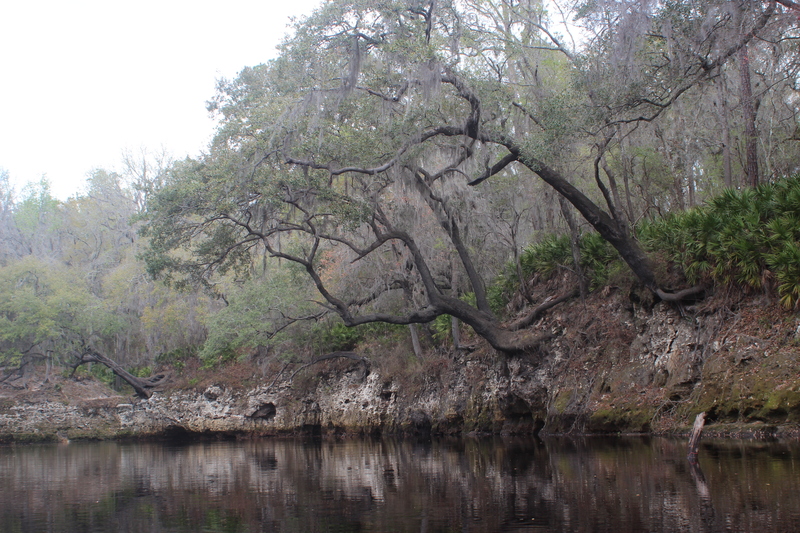 The topside of the Suwannee is where generations of tree’s have danced (and/or “twerked”) their own two-step for thousands of years. It’s a gnarly place. 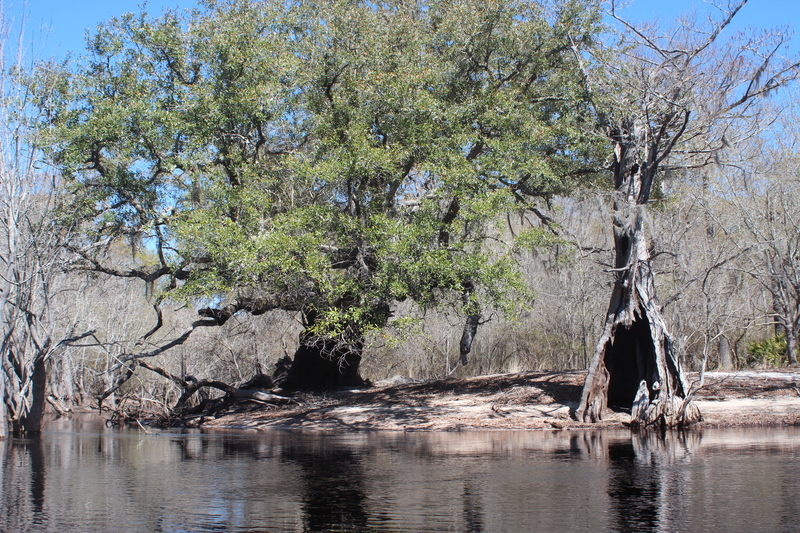 It’s a moments paddle through where one might sense the roots of these trees finding kindred ground within the stoic nature of time …. A day early and after an ez three hour paddle we found a primitive campsite; it was three oclock in the afternoon, early, but why not? 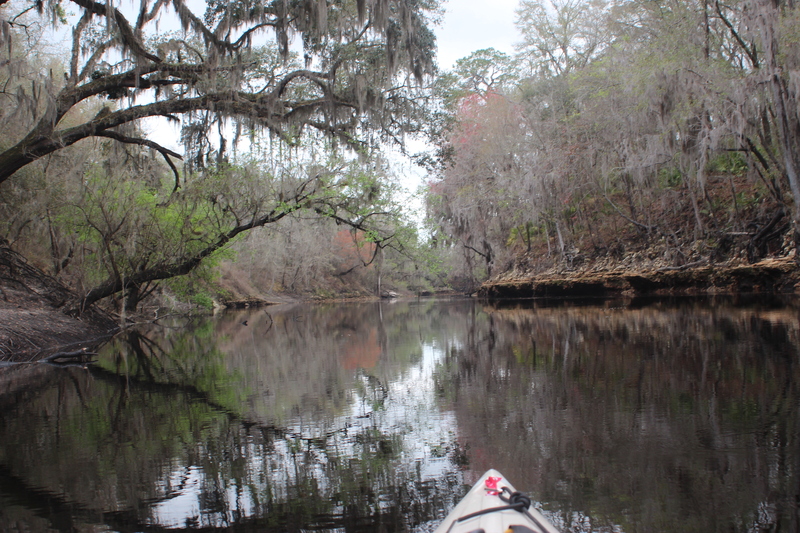 This trip is not about mileage, it’s a 4 day pleasure paddle…. Don’t get me wrong, I do/can cover mileage, but this trip is different…. We had passed and spoken with this fisherman earlier in the day, as the evening neared he came buzzing through the stillness; headed home… river life to home life. 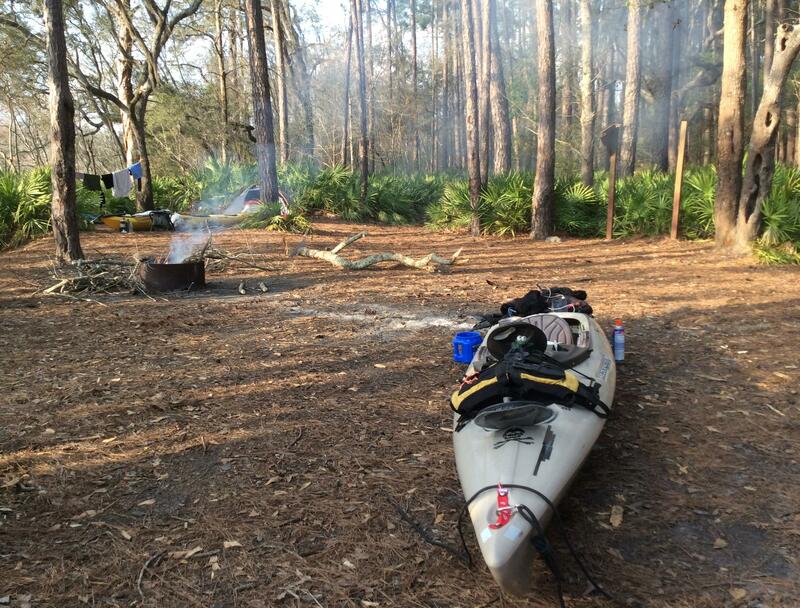 After a long paddle day (mileage) a good paddler goes down with the sun and rises with the morning light. 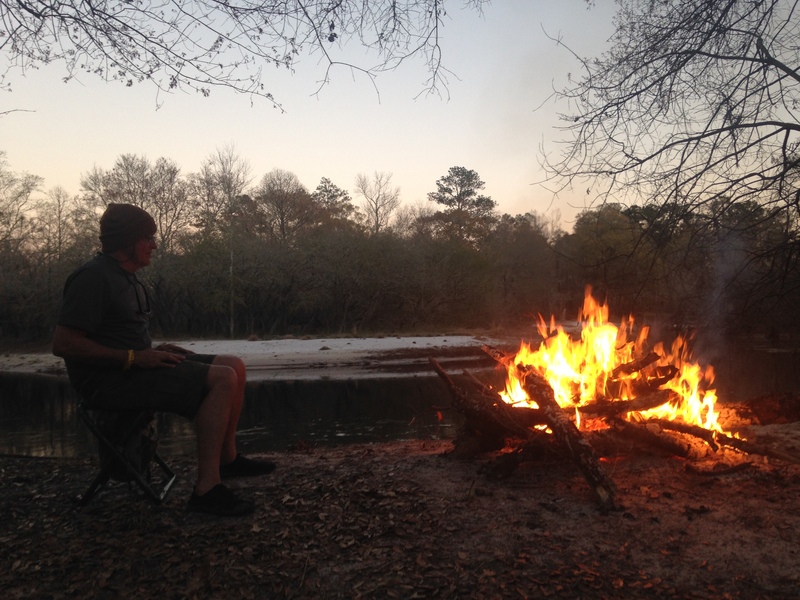 Of course when you’re off the river early; sitting around a campfire can last as long as you like. 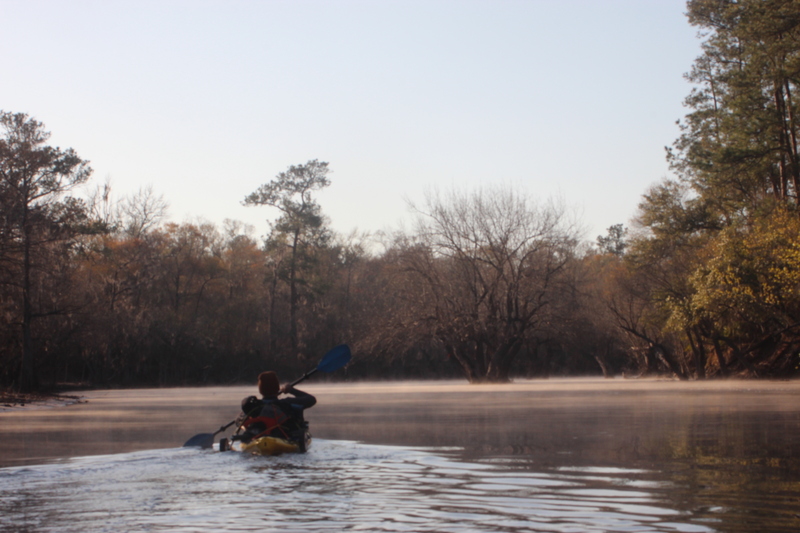 I’ve learned that with flatwater paddlin; to grasp the most of a river’s ambiance; start early (on the water by 8am) – the only noise is what you make. 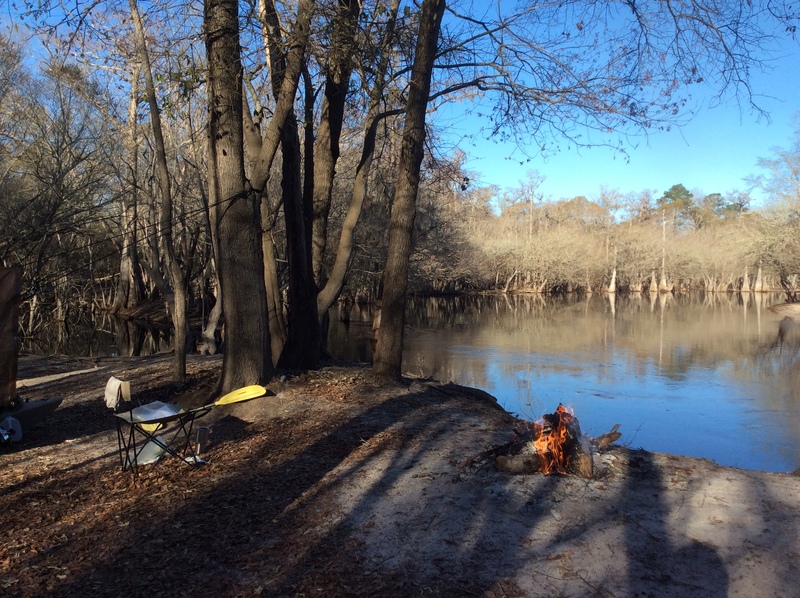 To savor being there; stop early (campsite picked by 3pm) – set up camp; and be part of the rivers nature for a little while (and have a great evening). OBTW; my interest leans toward ‘places and things;’ and not so much toward people. One of our factors in choosing a campsite was firewood; it was a good thing – because this night was a cool 42 degrees (and the fire had to be ‘stoked several times through the night). A mechanical type of waking, hot water for coffee, MRE, stowing the gear. There was a ‘nip in the morning air as we put-in; mornings are absolutely the best part of the day. 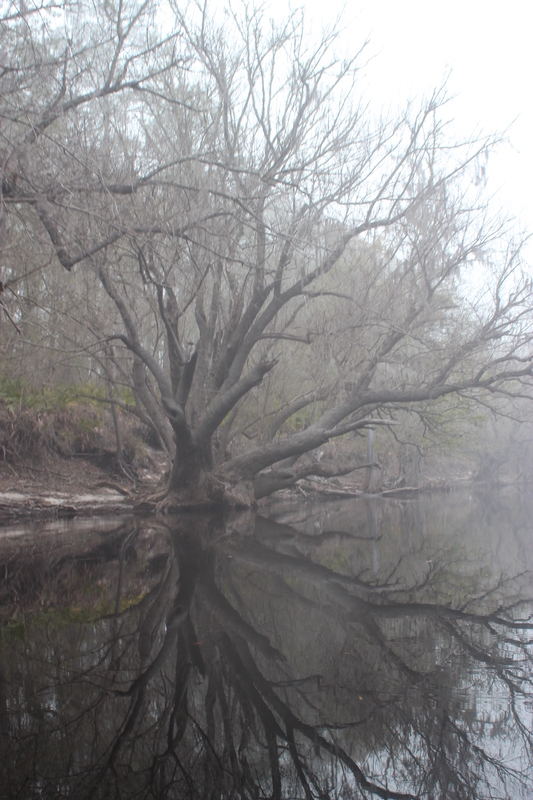 Its a muffled quiet in the haze, misty spider webs hang throughout the trees, it’s all there for you to absorb. Once again; for the most part – the only noise out there is the noise that you make. Night two was just before Cone Bridge landing. 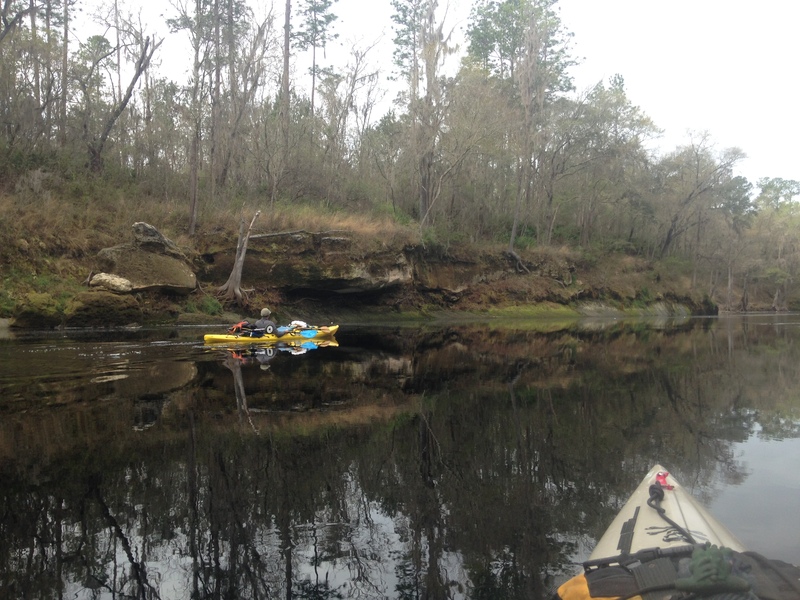 In the miles before limestone rift of Big Shoals the movement of the Suwannee is slowed, more soft paddling. 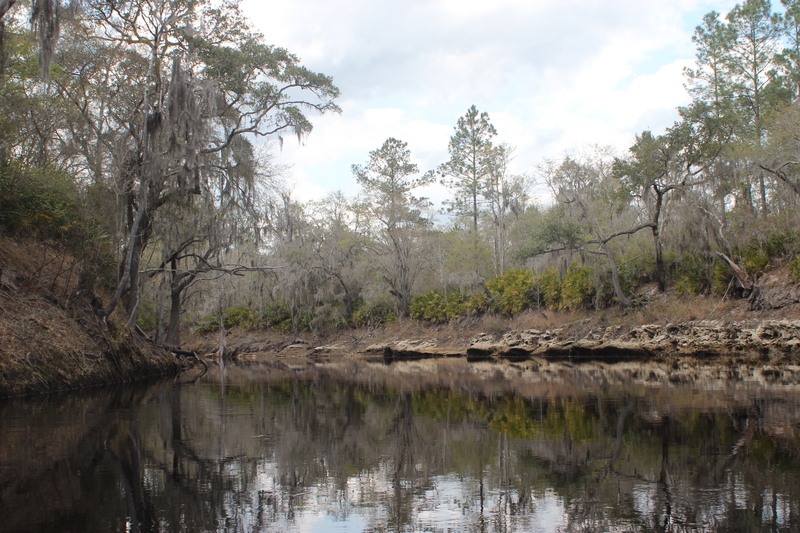 The slow water of the elongated pools create more stable habitat for wildlife. 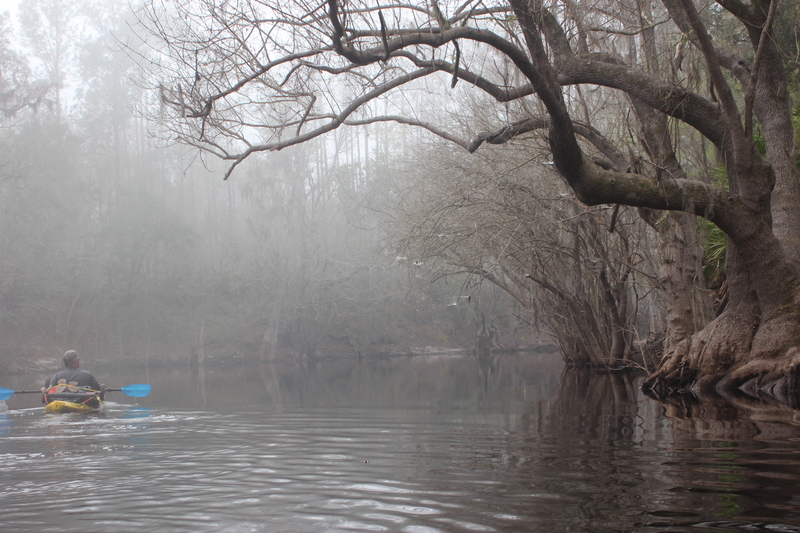 Paddling through the still tannic waters of the mornings; both physical and mental reflections move about freely. Simple complexity. 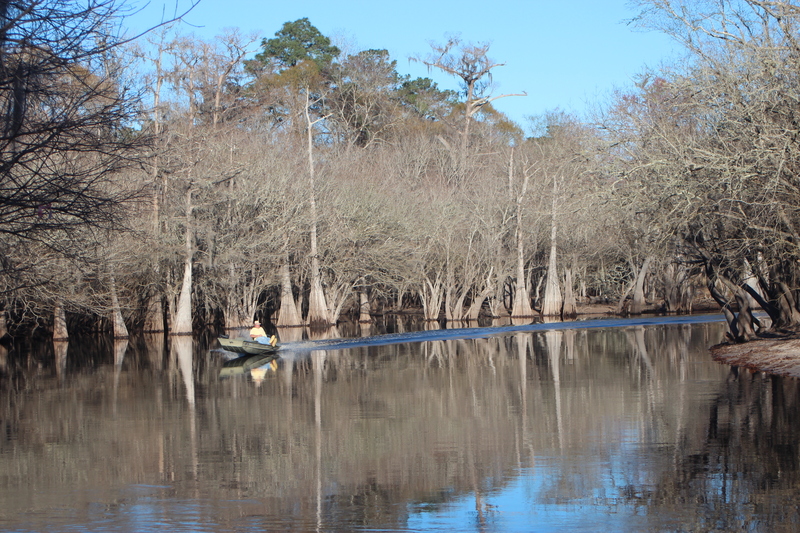 Big Shoals was the target for Tuesday in our original paddle plan, but leaving Sunday we were a day early. Making it early to the portage of Big Shoals left us with the possibility of hanging out for the afternoon – which it would put us back on our original schedule. A great camping place; so we did. Putting in below Big Shoals the following morning was uneventful (it can be a challenge), the few miles before White Springs we were accompanied by the sud’s from the churning waters of Big Shoals. 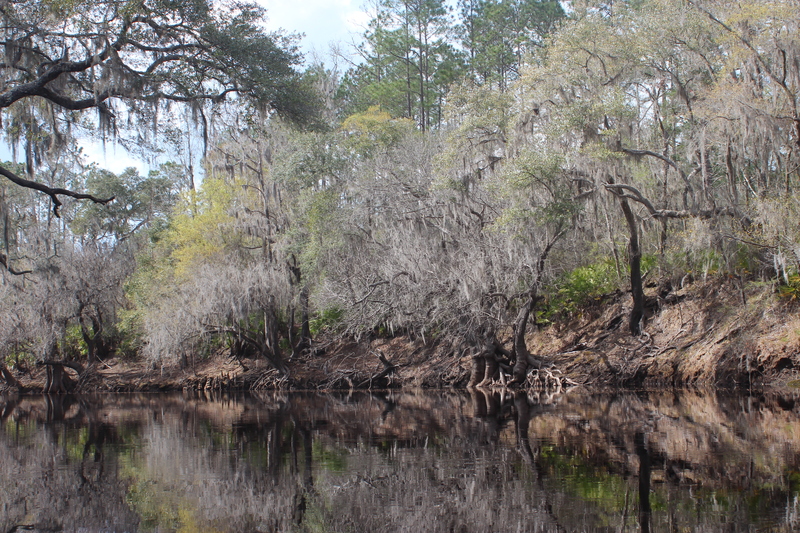 A byproduct of the vegetation which gives the Suwannee its darkish colors, the suds disappear with time. It can be a little surreal moving along with/in it at times. 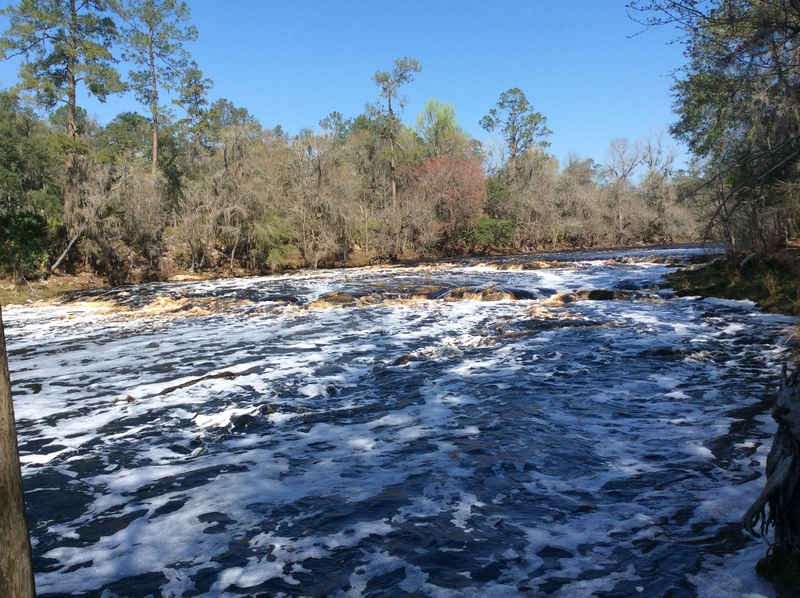 Whats below or along the Suwannee shorelines dictate the direction and movement of the water by altering its perpetual current. Where its possible to imagine those obstacles with the turbulence of the surface – the suds provide a more visible definition to the maze of resistance beneath. I felt that a kayaks negative contrail would look pretty neat if filmed or photographed by a drone while moving through this sudsy mass…..
Musses. 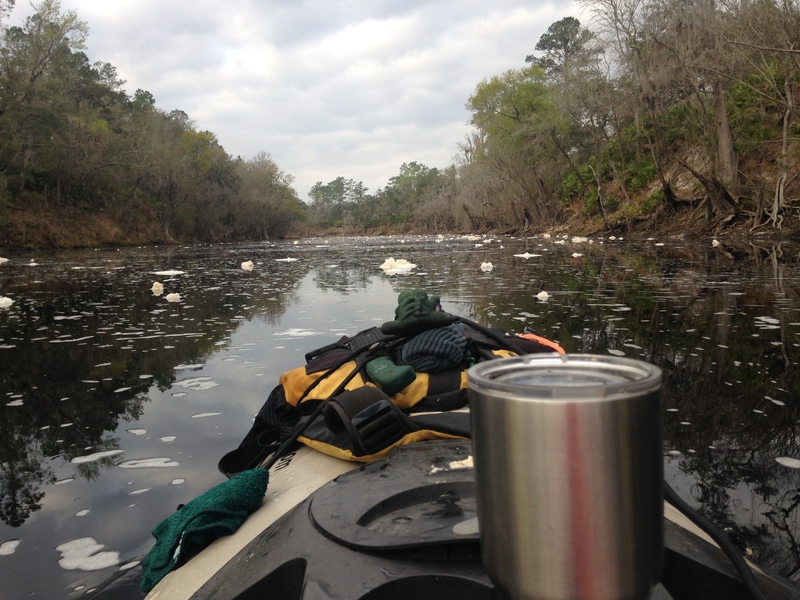 At White Springs the suds disappeared; a comfortable mornings paddle while enjoying yesterdays cold coffee (I sure like those Yeti-type cups). A roof and heck yes, a hot shower! 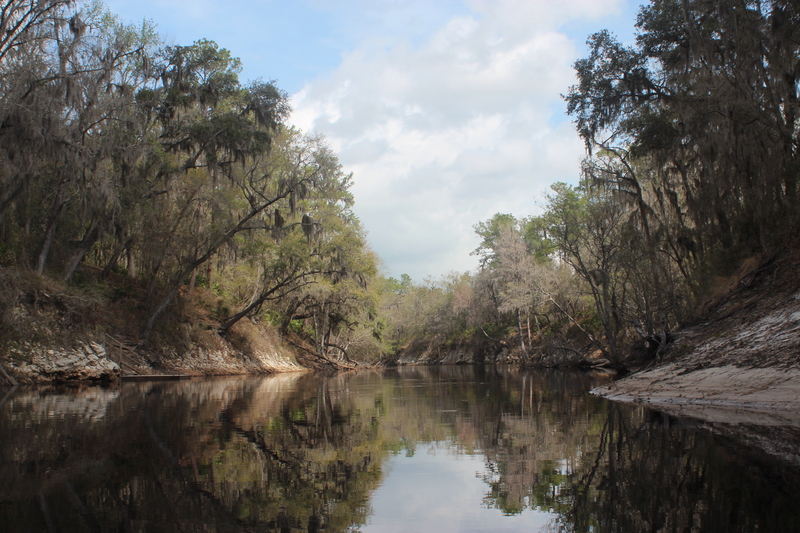 Woods Ferry is the first of six river camps available free to paddlers and hikers (Woods Ferry, Holton Creek, Dowling Park, Peacock Slough, Adams Tract, Anderson River camp) all part of the State of Florida’s Suwannee river wilderness trail, great job folks – thank-you. 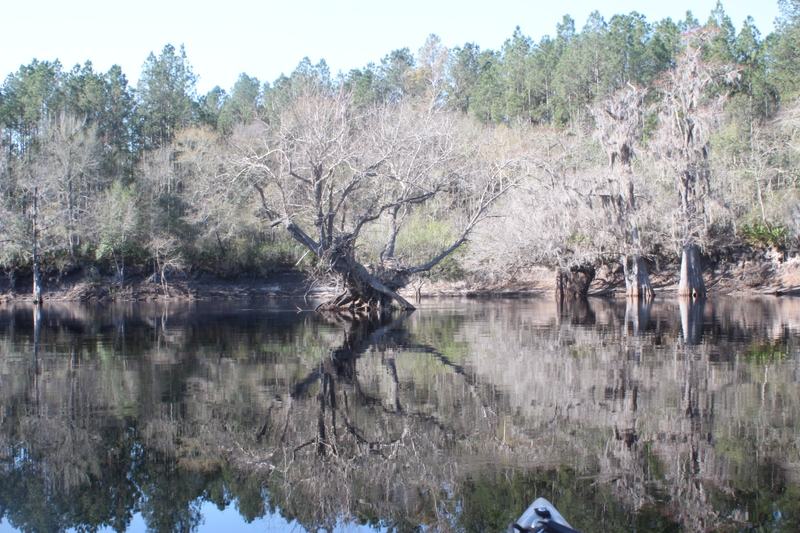 It was all coming together…..
Moving along a peaceful river helps…. Good to see you posting again. Hope to see more soon. Hey Tom, thank you for ‘bacshortly’. 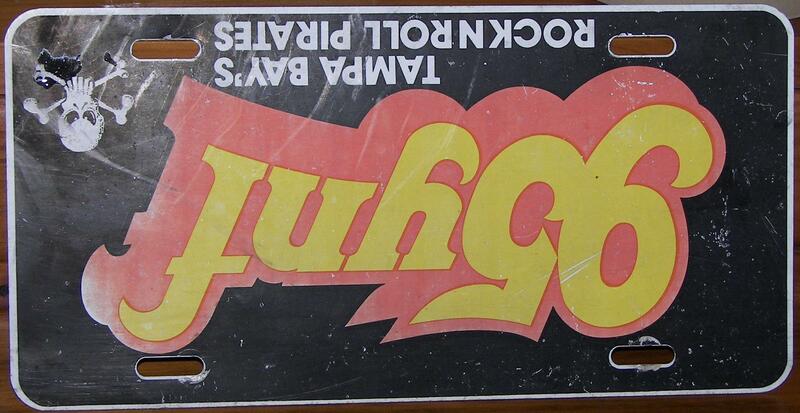 I lived in E Flat Rock for about 6+ yrs when I was a much younger man, 28 to 35. I only became a part of the area because of employment but it was the best time of my life. Eckerd Wilderness Camp on Pinnacle Mtn was in full swing at that time. I’m sure you’ve heard of them. I worked at this for a couple years and the carrot before the horse for each of the groups I worked w, was the final/wilderness trip. 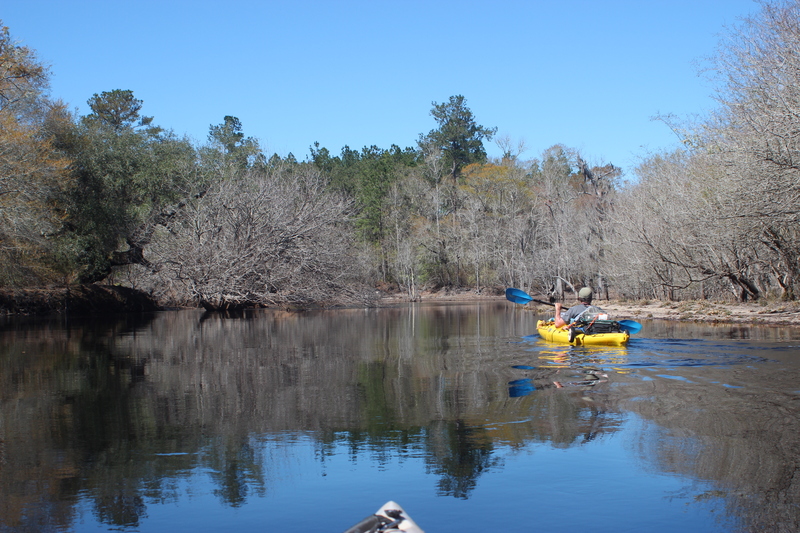 The Suwanee River from Fargo to Manatee Springs was one of these trips. Thanks for the memories jogged from your photos and comments. I appreciate your paddling and your writing style. (just turned 60 this month). Thanks for your interest John, I appreciate that. 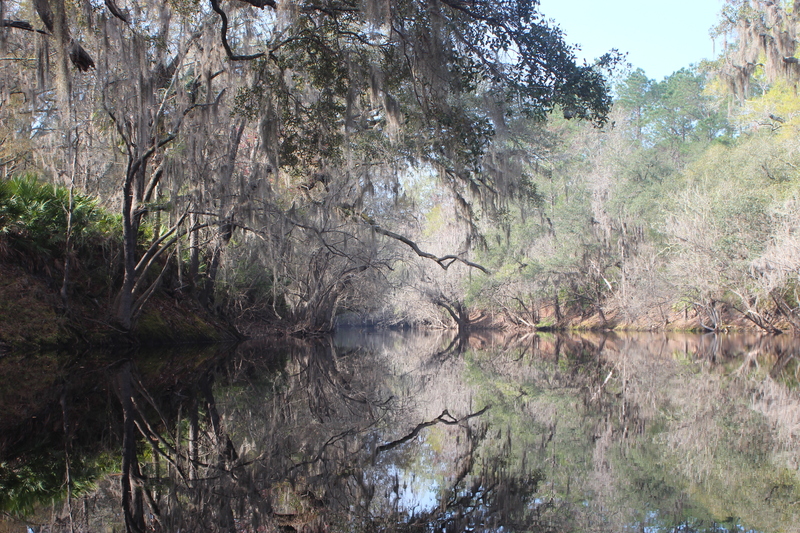 The Suwannee has an aura about it for sure. I’d like to say it stays the same through the years and much of it does if you look into it, especially on the topside from Fargo. The lower part of the river holds special interest too, where the high/low fluctuating (at times rapid) water challenges the folks along its banks with their access (docks, etc). The water creates an interesting muse along the way. Hope to see you out there one day…………. The best thing about doing something; is having the chance to do it again.. Enjoyed this immensely! My first “wilderness” trip on this very path in a few days. (62 y Glad I found your site!